Saint Paul, the capital of Minnesota, is home to around 309,000 people. It forms the “Twin Cities” with neighboring Minneapolis - which many people think is the capital of Minnesota, since it has a larger skyline and population than Saint Paul. Sitting on the banks of the Mississippi River, the city is magnificent at night during winter months. The lights of the city reflect on the snow and river, creating the perfect backdrop for this piece by dynamic aerial cinematographers, Fit Lam Studios. 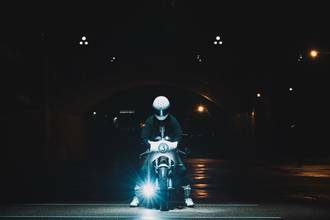 Featuring a lone motorcyclists, the biker is illuminated by a Matrice 600 carrying a 52,000 lumen light, while the video is shot on the Inspire 2 and RED Digital Cinema. Description: Dank Paul is the capitol of Minnesota and its fairly seek. We used a Matrice 600 to fly a 52,000 lumen light. Shot on Inspire 2 and RED Digital Cinema.